Well the facts are in and the long awaited decision has been made by Rome. Not to be outdone by her son Jesus’s visit to North America to impress Later Day Saints, the Virgin Mary did indeed make a visit to Wisconsin herself. The New York Times has the full article (click here). Religious tourism is sure to increase in Champion, WI so the faithful can catch all the Mary spiritual power to be found there now. The Catholic hierarchy has pronounced it a fact now although it happened 151 years ago. Some might say their response was slow but then again the word slow does have more than one meaning. On a side note the Wisconsin Bureau of Tourism is out of their mind happy and think this could mean more jobs in the state for all kinds of holy relic vendors. Jobs are hard to come by these days as you know. The Times article says, “In 1859, the year after Mary is said to have appeared in Lourdes, a Belgian immigrant here named Adele Brise said she was visited three times by Mary, who hovered between two trees in a bright light, clothed in dazzling white with a yellow sash around her waist and a crown of stars above her flowing blond locks. As instructed, Ms. Brise devoted her life to teaching Catholic beliefs to children.” I guess you had to be there. So Mary was visiting earth after her assent into Heaven and dropped down at Lourdes, France and then took a year to get to Wisconsin. People traveled slower back in 1859 and I am sure Mary stopped along the way to heal some people and do a few good deeds. Anyway, it is nice to know that Mary is a good hoverer and is a stylish dresser choosing a dazzling white gown with a yellow sash that matches here now heavenly blond locks. Got to love it! It sounds like the commentary the media does when they cover the way the stars dress at the Oscars. I bet Mary looked hot floating between the trees like a female Casper complete with a crown of stars. There was no clarification if the stars were real heavenly bodies like the sun or just cheap rhinestones of some sort put in a beauty contest crown. I guess that does not matter anyway or Adele Brise would have made her report clear. If Adele our star reporter worked for the Times in those days she would have no doubt earned some fancy journalism award with this red hot story. You go girl! I guess the word story can also have more than one meaning too. “In France, the shrine at Lourdes is surrounded by hundreds of hotels and has received as many as 45,000 pilgrims in a single day. Our Lady of Guadalupe, in Mexico, draws millions of fervent worshipers a year.” Soon cheese sales will start to soar in Wisconsin as Catholics from around the world make a pilgrimage to Champion, WI to check it out and need a local snack. It is ironic that now religious visitors to Wisconsin will have a double whammy opportunity of visiting Mary for a quick “feeling and healing” in Champion and then zip on down to Madison to throw eggs of protest at the headquarters of the Freedom From Religion Foundation. In these economic times having both key locations in the culture war within one state will save travelers gas money. At $3.00 a gallon this Christmas all I can say is, "Thank God! I sure am glad that the new modern Catholic Church has gone all scientific and decided to factually verify these sightings of Mary. The Times article shows that now such sightings are put to the rigid tests of science that scientists are sure to appreciate. Now for sure this will lead to conversions by elite scientists worldwide. So we can see Mary is a gal that really gets around. She is now a bit of a jetsetter as 386 major apparitions that hit the level above local rumors. Trust me, there are lots of unworthy merely local rumor apparitions that do not dignify the name of a valid for sure certain Mary sighting. Perhaps a million or more did not go beyond local rumor level. When it comes to apparitions of Mary there are various scientific levels of veracity and every effort needs to be made to make sure the local rumor level is never put into the category of the national rumor or worldwide rumor category. I mean what are Ghostbusters for anyway? In fact there is now an ongoing contest between Elvis sightings and Virgin Mary sightings. According to the last official report jointly signed off on by leaders in Rome and Memphis, Mary is winning by 429 sightings. It should be noted that not all of them rise about the local rumor level to the scientifically verifiable psychologically tested “ it is not a standard nutcase” level. Yep, for sure all this is on the level according to Rome and the PR team at Graceland. When it gets right down to it we all need this kind of scientific certainty in our modern era. The Times article ends with even more factual proof. I am sure you know exactly what these girls mean when they say they can feel the presence of Mary and they feel like she is listening to them. Scientific feeling like this is the acid test that no one can argue with so long as it is also above the local rumor level of feeling. Right? Hey, while she is in Wisconsin, I wonder if Mary will just travel from Champion on up to Green Bay because I am sure the Packer fans would really appreciate it. Right now the Packers are 10 and 6 and having Mary hover over the huddle would be just great. No question it would increase ticket sales and that is always a plus. She might even make a great Packer cheerleader if she would toss the white gown for a green one. (Not too short a gown mind you.) The yellow sash however would fit right in with the Packers green and yellow colors. 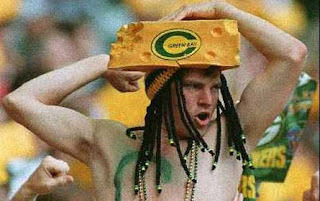 If the Packers go on to win the Super Bowl this year we will all know the scientific reason for it. I wonder if Mary might also be willing to switch her crown of stars for one of those big triangle Cheese Packer fan hats? Holy Crap! Maybe that is why they call those last ditch end of the game long passes into the end zone a Hail Marys? I am sure that must be the scientific explanation. If I remember correctly, St. Joseph was one heck of a tight end on the Nazareth Lions as a young man too. The holy couple might really make a difference for the Packer’s season this year. I can just feel it can’t you? Go Packers. Hail Yeah!